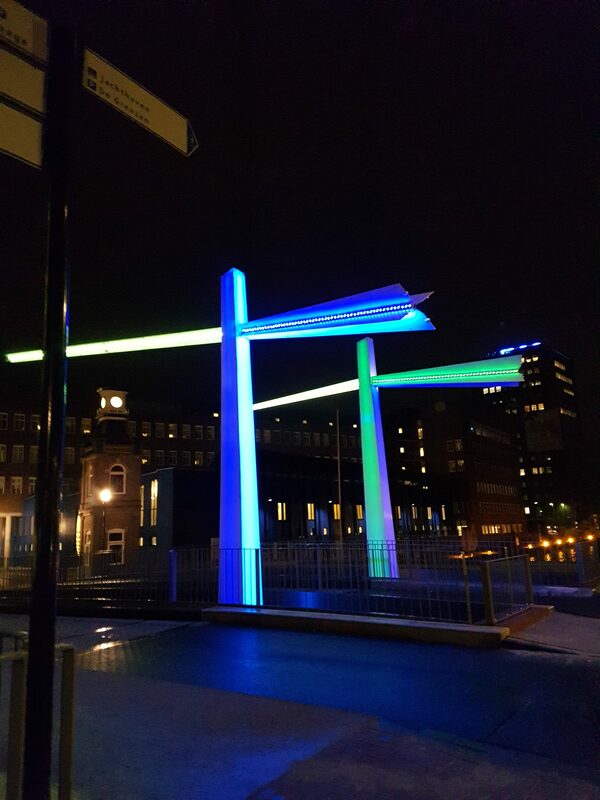 This week the new Egbert Gorterbrug in Almelo, the Netherlands, has been officially opened: a gateway to the city centre, located right next to the townhall. It is an important step in the plan Almelo Water town, reintroducing the water in the city centre. A sculpture has been installed on the bridge, announcing and suggesting the moveable bridge that is foreseen in 10 years time. This abstract artwork has been constructed with translucent FRP panels mounted on a steel core. The structure is lighted from within by means of dynamic LED- lights with a pallet of over 300 colours. Deze week is de Egbert Gorterbrug, naast het stadhuis in het centrum van Almelo, geopend. Een belangrijke stap in het plan Almelo Waterstad. Een kunstwerk wat het wenkend perspectief aangeeft van een echte beweegbare brug in de toekomst. Vervaardigd van vezelversterkte translucente panelen gemonteerd op een stalen draagconstructie. Van binnenuit verlicht met RGB LED-verlichting die alle kleuren kan tonen.